To think that thousands of years ago cavemen made their own fires for cooking makes us realize that having professional kitchen appliances is something we can be grateful for today. Each of us has our own appliance preferences: the oven, toaster, microwave, air fryer, blender, food processor, juicer, slow cooker, or even the good ole pressure cooker. You won’t have to wait for your foods to defrost prior to cooking. Everything can be made in one single pot. Can cook up to 70-percent faster. There are many different sizes of cookers at hand depending on your preference. There’s so many things you can cook in a pressure cooker from soups and stews, to meatballs, to cheesecakes and pies. Dishes tend to taste better as more of that “good stuff” is retained during the pressure cooking process. This cooking method saves energy. Pressure cooker vs slow cooker? 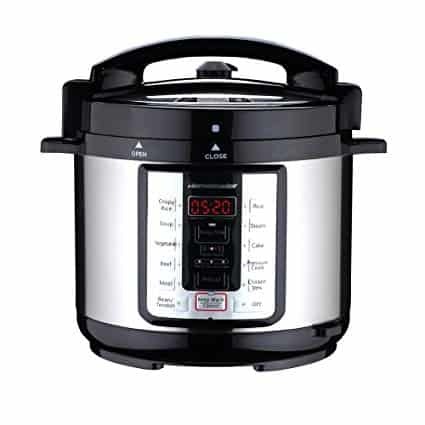 This cooker model can have similar effects on food as a slow cooker, yet it cooks significantly quicker. There isn’t as much cleaning required when you cook this way. Many are even dishwasher-safe. A pressure cooker doesn’t heat the kitchen up as much as many other ways of cooking (especially great for cooking in the summertime). Many devices have other cooking methods apart from pressure cooking, making them quite versatile. There are hundreds of options with different styles, features, and cooking options; it can kind of be overwhelming. 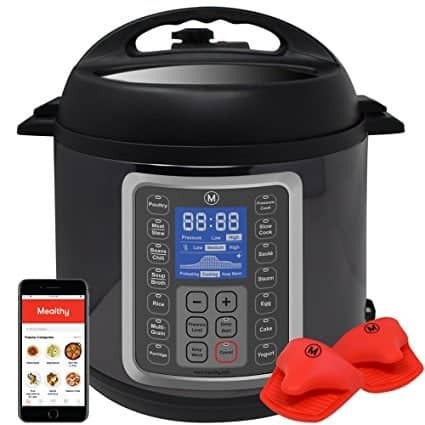 Multipot by Mealthy has hundreds of excellent reviews online and a plethora of cooking options along with convenient accessories with the pressure cooker purchase, yet, it has virtually the best pressure cooker price for everything you get in one bundle. The Multipot is long-lasting, consistent in its heat output, and is incredibly user-friendly. Even if you’re new to pressure cooking, the Mealthy Multipot can still be a great option for you as everything is ideally laid out. 9 ways to cook: Pressure, Slow, Sauté, Steam, Pasteurize, Yogurt, Cake, Rice, and Warm. Coming to the next model on our list is the Homeleader 7-in-1 , a beautiful, 304 stainless steel appliance. 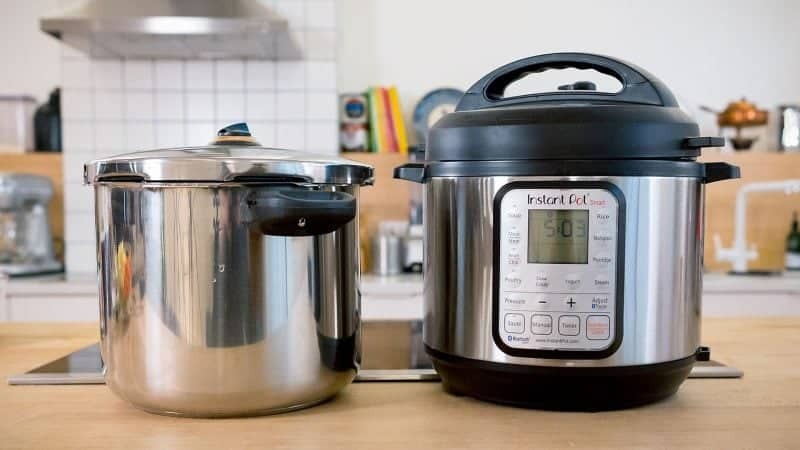 When you opt for this device, you don’t just get an incredible pressure cooker, but also a rice cooker, stockpot, steamer, warmer, oven, and slow cooking unit all in one. Unlike some pressure cookers, this one is dishwasher-safe. And a bonus, this ETL-approved cooker comes with a one-year warranty from the purchase date. Instant Pot is one of the best pressure cooker brand names out there. Their UL-certified Ultra 3 Qt model offers the perfect amount of space to cook for two to three individuals. It offers a bright and easy-to-read LED screen and contains up-to-date 3rd generation technology, complete with a microprocessor. Additionally, this cooker is constructed with 304 stainless steel without any chemical coatings and it’s dishwasher friendly. Bella’s BPA-free, dishwasher-safe BLA14467 offers an easy, non-stick way to cook anything from risotto to chicken. No worries about safety issues; Bella ensures this programmable unit is set with steam release valves and an air-tight locking lid. Overall, the BLA14467 offers a wide array of different cooking presets; however, the digital display is kept pretty simple compared to other pressure cooker brand’s models. This Bella cooker in general, while it works well, isn’t super tech-y compared to some out there. A limited two-year warranty is included with the BLA14467’s purchase. 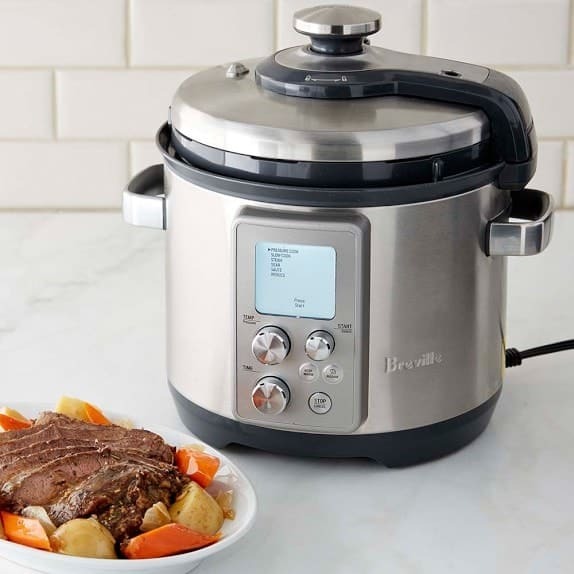 Whether you prefer to cook low and slow or love high-pressure cooking, you can get the best of both worlds with the Breville Fast Slow Pro Multi Cooker, as cooking times range from two hours to 12 hours. Breville’s non-stick cooking pot makes cleaning simple, and it can just be popped into the dishwasher if you want a more thorough cleaning. Generally, the design, operation, and features of the Fast Slow Pro are well-appreciated, and you get it all for a moderate-to-low price. 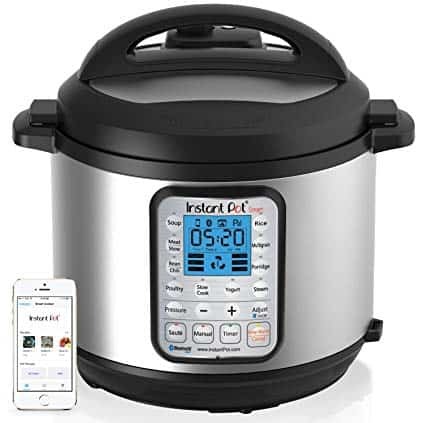 For those who want a pressure cooker with Bluetooth, you’ve got it with the Instant Pot Smart Bluetooth 6 Qt 7-in-1 Programmable series. 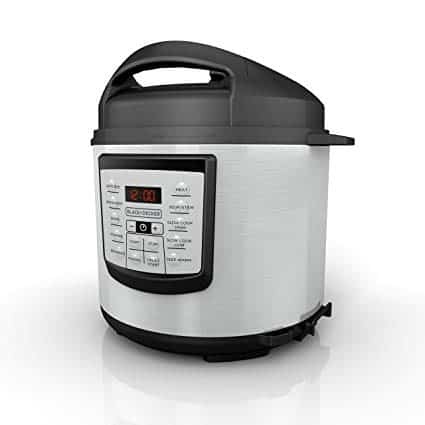 You may have thought you hit the jackpot finding a model with seven different ways to cook; however, the Bluetooth connectivity allows you to monitor and control your pressure cooking while it’s in operation. If that isn’t a convenient and incredible feature, I don’t know what is. That said, those who want something with the latest technology, opting for a Bluetooth equipped model may be ideal choice for you. 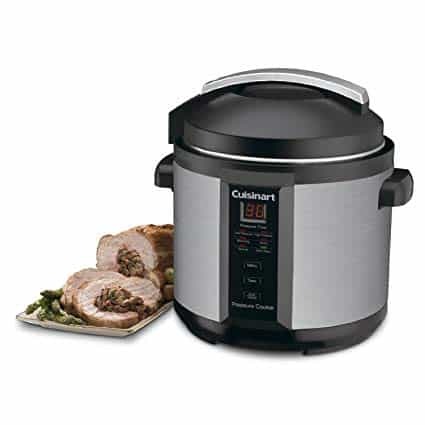 As one of the best electric pressure cookers out there, CuisinArt’s CPC-600 is BPA free and offers a non-stick, dishwasher-safe pressure cooking pot. This pressure cooker also offers a limited three-year warranty, which in the pressure cooker world is pretty generous. 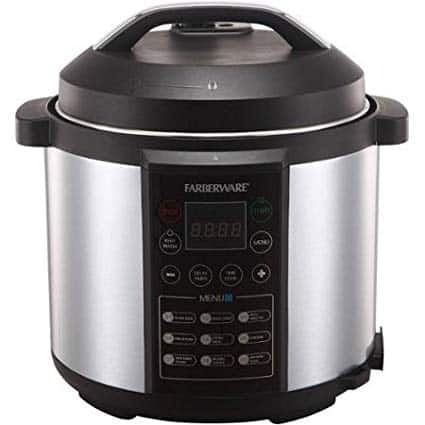 While it doesn’t have a significant amount of cooking options, the CusinArt CPC-600 Electric Pressure Cooker is very affordable among pressure cookers and has favorable reviews as one top pressure cooker at Amazon. The Chefman 6 Qt Electric Multicooker is another affordable unit and can easily be considered the best pressure cooker under $100. 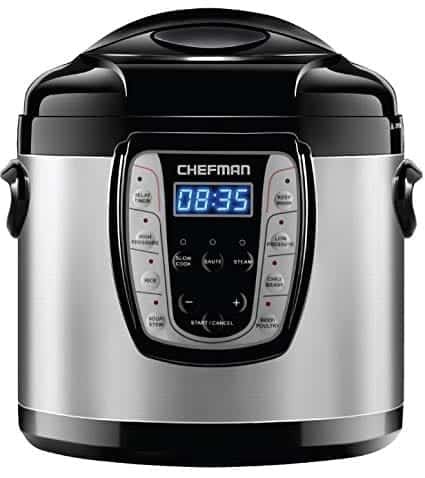 One of the most favorable features of this Chefman is that it offers a 24-hour timer to delay cooking, giving you plenty of prep time. This is important for many working individuals who want to come home to a delicious, finished meal with a pressure cooker rather than a slow cooker. In general, this cooker is sleek, clean, and modern. It gets the job done, and well, it comes with a one-year warranty. For its price point, you’re getting everything from heavy durability to plenty of preset cooking features. Have you ever thought of using pressure cookers for canning? Well, you can with the Presto 01781 23-Quart Pressure Canner and Cooker! This giant canner and cooker duo, while primarily for used for canning, can cook massive amounts of food. Did you know that the USDA deems canning the only truly safe method for preserving poultry, meats, seafood, and vegetables? It’s true! Best of all, it offers a 12-year limited warranty, which easily beats out many other models – and it’s under $100, making it one of the best stovetop cookers out there! Its versatility and capability alone may this Presto appliance a must-buy. While it doesn’t offer any other methods of cooking apart from pressuring canning and cooking, if you are happy with just the two, you’re all set to go. The dishwasher-safe, non-stick Black + Decker 6 Quart 11-in-1 is priced at just $80, and you get a lot of bang for your buck. With its delayed start feature, you can get your food cooking when you want it to, so it will be warm and freshly-done right when you get home. This is the perfect machine for a family of four. It is easy to clean, has an attractive design, and has well-organized buttons and a bright display screen. With the addition of a whopping 11 ways to cook, this device can’t get much better! Here’s another attractive, dishwasher-friendly model, but this time by Farberware. For under $80, just one use and you’d be thinking you received an item worth double the price. However, I must say, one downside is that all of the cooking settings are pre-programmed on this device, so manual cooking isn’t an option. 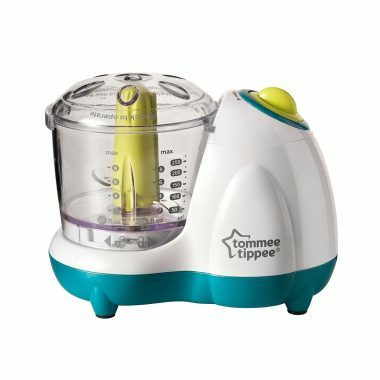 It has plenty of other options to cook the way you want, but if you’ve never used one of these before, reading the instruction book probably won’t help you out much. So, ask for help, do some research online, or work with a trial-and-error mentality. 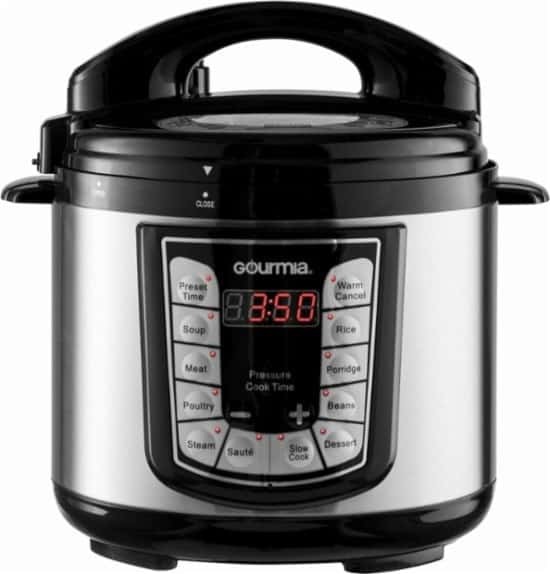 The Gourmia GPC400 4-Quart unit offers a huge selection of cooking and timing options. If you plan to use your pressure cooker often, this may be the most top model for you. This ETL-certified cooker is complete with a non-stick interior with a stainless-steel exterior, easy-grip handles, and one-year warranty. Surprisingly, this pressure cooker is under $70, yet it has the aesthetics, many options, the ability to work well, and a quality interior and exterior. 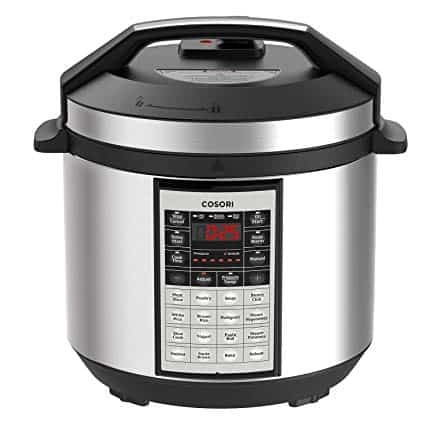 Cook for 4 to 6 people with the Cosori 6 Quart 8-in-1 Multi-Functional Programmable unit offering many ways to personalize your method of cooking. With amazing smart control programs and ETL, UL, and FDA certification along with food-grade, dishwasher-safe stainless steel, you can ensure to get quality and function in the same cooker. Due to its user-friendliness and reliable, versatile technology, the Cosori 8-in-oneis ideal for both beginners and experts. 17 presets: Slow Cook, Meat/Stew, Poultry, Soup, Beans/Chili, White Rice, Brown Rice, Bake Multigrain, Hot Pot, Steam Vegetables, Pasta/Boil, Steam Potatoes, Yogurt, Sauté/Brown, Reheat, and Automatic Keep Warm. Whether you’re new to pressure cooking or not, there’s a lot you need to know before you make your purchase. 1. How do pressure cookers work? These devices cook food by sealing steam into an airtight pot. The trapped vapor of water, broth, or other liquid within the cooker increases the pressure and thus the temperature in the pot. 2. Are pressure cookers dangerous? Modern models are deemed safe as they are equipped with a safety valve that will burst to let excess steam out if the pressure gets too high in the pot. These cookers have been thoroughly tested and redesigned over the years for safety. In fact, the number of cooker deaths per year is a low figure, and there’s an average of 30 reports of all cooker-related incidents (injuries included) recorded annually. The only real way that these cookers are dangerous is when they’re operated without care, such as if the operator puts their face near the device’s safety valve and get scalded, if someone opens the lid before the food is finished cooking and gets splashed with boiling water or steam, or if someone touches the cooking pot or objects inside the pot while it is in use. In other words, they’re very safe, unless you’re using an older machine that’s poorly made or aren’t operating it safely. 3. What does a pressure cooker do? Using high pressure created from boiling liquid, a pressure cooker cooks food quicker than a traditional pot. 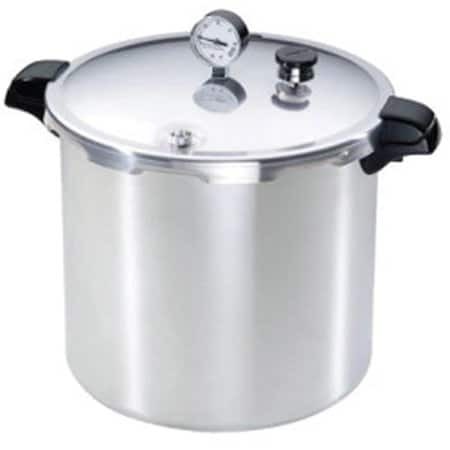 The tightly-sealed lid of a pressure cooker allows not just the pressure to rise but also the temperature. You can achieve cooking that is 70-percent quicker than other ways of cooking. 4. What is the best pressure cooker cookbook? 5. Can pressure cookers explode? These cookers can explode just as anything with high pressure can. However, new pressure cookers designed with a safety valve are less likely to explode than older units. That said, do not use a pressure cooker without a safety valve. If yours breaks during cooking, this should be replaced. Additionally, you should replace your cooker every once in a while to ensure it has the latest safety features and testing. Overall, the chances of one of these actually blowing up are very slim, but with the right safety measures, you can reduce the chances further. It’s also important to remember that pressure cookers have been used since the 1600s, and experience has taught the designers quite a lot. 6. Are pressure cookers healthy? Cooking this way can actually be healthier than other ways of cooking as it traps in more nutrients, that is, if what you’re cooking is healthy to begin with. 7. Do pressure cookers kill nutrients? No, the reverse is true. Pressure cookers help retain more nutrients than most other cooking methods. Additionally, most nutrients are more likely to survive the cooking process as there is a a nice slow period of time involved. 8. What are the best things to cook? For some of the best pressure cooker recipes, refer to Question 4. They don’t make noise unless its pressure limit is close to being reached. In that case, lower the burner a bit to reduce some of the pressure. In other words, if a cooker is making noise, it’s a warning sign. 10. Does the food taste good? Because flavors are better trapped in pressure cookers, foods can have more flavor. Meats especially turn out more flavorful, juicy, and tender when cooked this way. 11. Do they use a lot of electricity? Compared to other methods of cooking, pressure cookers don’t use as much electricity. Since they cook food approximately 70-percent faster, thus saving approximately 70-percent of energy. They’re fairly eco-friendly due to this. 12. Is a pressure cooker and slow cooker the same? These cookers are different from slow cookers because they utilize high pressure and cook at faster rates. Slow cookers are inside designed to cook things long and thoroughly. But both appliances can cook pretty much the same foods. 13. Are pressure cookers allowed on flights? Yes, they can be brought on planes as carry-ons or checked baggage, but check with your specific airport just to be on the safe side. Some models may exceed cabin bag dimensions. 14. Do pressure cookers cause cancer? No. Interestingly, cooking this way can help eliminate two carcinogenic compounds known as acrylamide and heterocyclic amines. However, some may not be so concerned about potentially cancer-causing coatings on their pressure cooker itself, but you can find may models on the market without these coatings. 15. Can pressure cooker be washed in dishwasher? Most models are dishwasher safe. However, always check the instructions carefully before washing them in dishwasher. 16. Will a pressure cooker work for canning? There is a difference between a pressure cooker and a pressure canner. Cookers are not designed to can food, but rather, cook foods. However, there are pressure cookers for canning out there. 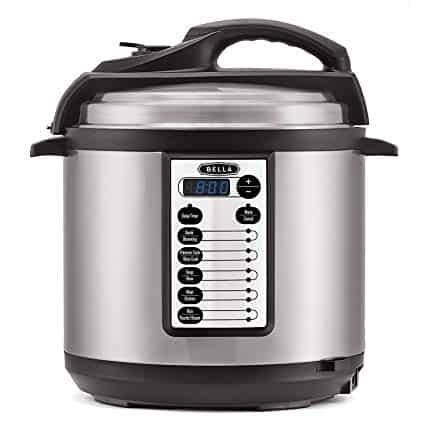 So, not every pressure cooker will have the capability of canning; never try canning with a one of these unless the product is capable of both. 17. Will a pressure cooker tenderize meat? Yes, these machines can tenderize meat very well, similar to a slow cooker. They achieve this by melting the collagen in meat into a gelatin thanks to its higher pressure and temperature. However, in some other ways of cooking such as roasting or searing, the collagen in meat tends to toughen up. 18. Are they worth it? Not everyone will benefit from an appliance like this, but they are extremely versatile and have a lot to offer. Before making your purchase, consider the following pros and cons to decide if it’s an appliance you will want and need in your kitchen. 19. Where can I buy one? There are plenty of places to buy a pressure cooker. You can get pressure cookers at WalMart, Costco, Target, Kohl’s, and other retailers . You can buy them online at Amazon, on eBay, and other online platforms. There is an endless number of things that can be cooked using the pressure method, from tough meats to sweet treats. These appliances offer many different modes and settings. They’re fairly compact devices and can be bought in many different sizes depending on how much you’d like to cook. They don’t require a lot of cleaning. Plus, some of them are even dishwasher-safe. More flavors and nutrients are retained when you cook different foods in pressure cookers. You can also use your pressure cooker to preserve food. 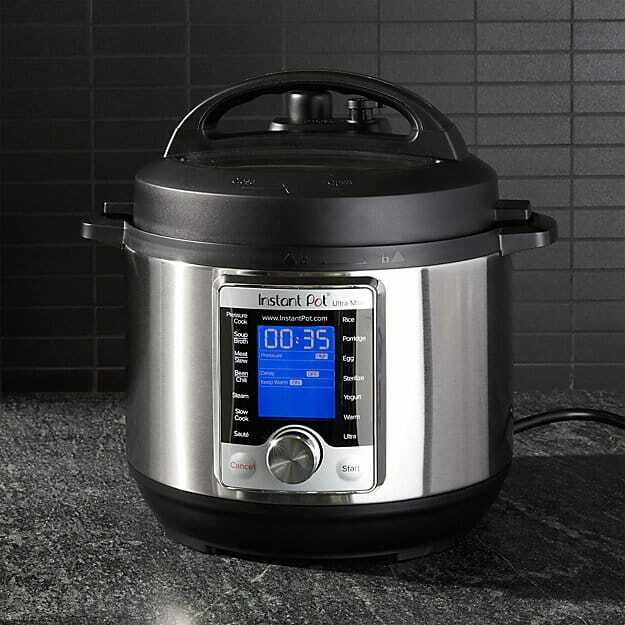 Chances are, you can find plenty of pressure cookers for sale in your price range as prices vary drastically depending on your needs. Some cookers double up as canners. Pressure cookers generally make for easy cooking as there isn’t a whole lot of effort that goes into it. Most models only offer a one-year warranty, which isn’t that great. While they are considered safe devices overall, there is a still an outside chance that one of these machines can explode if not used correctly or if it is poorly made. Ultimately, adding a pressure cooker to your kitchen is a wonderful investment for many, that is, if one plans on actually using it and not just shoving it in your cupboard to collect dust. When you have a kitchen appliance that is easy to clean, efficient in its cooking, and very flexible in what it can make, it’s hard to say no. Don’t let the fear of it blowing up stop you from opting for one, as it’s extremely rare. These safe appliances are so goo, you’ll feel silly for not having used one sooner!